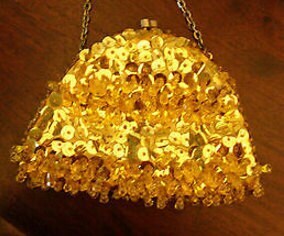 Bright and beautiful vintage gold evening bag. Covered with sequins and beads and lined with a matching gold satin. The small chain shows a patina from age as is expected but still very nice. Gold tone frame and kiss closure. 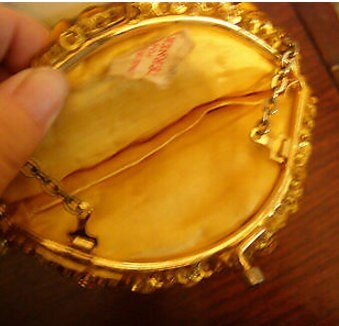 The inside tag reads "Made in Hong Kong for the Turners." Lining is nice. Maker's tag shows signs of wear. Dimensions: 6.5 inches long x 4.5 inches tall. Fab piece!